When Randall Cobb snagged that over-the-shoulder pass with his left hand on the penultimate play of the first half on Sunday Night Football, somewhere a State Farm advertising agent was crumpling yet another piece of paper inscribed with the company’s next Aaron Rodgers promotion. Discount double triple quadruple quintuple sextuple check it is. The six touchdown passes that Rodgers threw against the ready-for-hibernation Bears shouldn’t be diminished simply because Ben Roethlisberger had previously made it a weekly occurrence. The Packers quarterback even found a way to up the degree of difficulty, and in the process he caused all of our imaginations to run wild. Any draft prospect would be happy to receive this Wonderlic question: Packers quarterback Aaron Rodgers threw six touchdown passes in the first half. If he repeats his performance in the second half, how many total touchdowns will Rodgers throw? That simple calculation obviously doesn’t account for changing variables, which is why the mythical eight-touchdown performance remained unlikely even with Rodgers’s prodigious start. Such an explosive first-half offensive performance usually signifies a blowout, which makes scoring less important to the winning team after halftime. Let’s be clear: If Mike McCarthy wanted to get Rodgers the passing-touchdown record, it wouldn’t have been a problem. But the reward is far too small considering the risk. Although Rodgers did throw three second-half passes before hitting the sideline, preventing injuries is the long-term concern, especially for a team that knows how miserable life is without its franchise quarterback. Records are meant to be broken, except, apparently, when they are set by Ernie Nevers, the Chicago Cardinals fullback who scored 40 points on six rushing touchdowns and four extra points to single-handedly beat the crosstown Bears in 1929. It’s the longest-standing record in NFL history, and the specialization of kickers means that breaking Nevers’s mark will require a seven-touchdown game.1 Only Nevers, Dub Jones, and Gale Sayers have scored six. 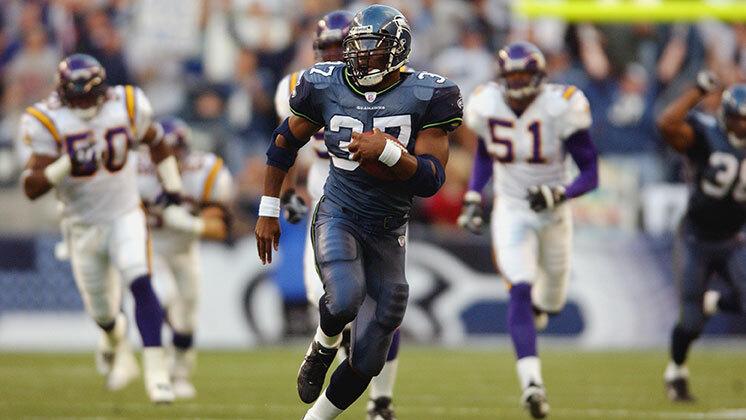 By rushing for four red zone touchdowns and adding an 80-yard score on a screen pass in the first 30 minutes against the Vikings in 2002, Shaun Alexander had a legitimate chance to make history. These monster first-half performances are so often about being in the right place at the right time, and Alexander benefited when the Vikings fumbled away two consecutive kick returns, allowing him to score three touchdowns in a span of 77 seconds. But fatigue and/or fate slowed Alexander down; his 13 second-half touches resulted in only 28 yards, including three unfruitful rushing attempts from inside the 10-yard line. It’s not easy to show up a receiver who catches four touchdowns in a game, but only hours after Terrell Owens set his career high in 2007, Randy Moss went out and collected four touchdown receptions in the first half. Recently arrived from a moribund Oakland team, this was a rejuvenated Moss, who celebrated his fourth touchdown — an end zone toe-tapper in the final minute of the first half that sent him sprawling — by giving a photographer a high-five while flat on his back. Most teams would play conservatively with a large halftime lead, but this was Bill Belichick and the Eff You Patriots, fresh off their bye week and ready to resume punishing opponents. Getting Moss his fifth touchdown reception — and tying the record shared by Jerry Rice, Kellen Winslow Sr., and Bob Shaw — was an obvious priority, but although Tom Brady threw two more passes to Moss inside the 10-yard line, his touchdown total wouldn’t budge before he was given a fourth-quarter rest. After returning from ACL surgery, Brady and the Patriots offense had a relatively slow start in 2009, averaging only 20.8 points through the first five games. Everything finally clicked against the 0-5 Titans, when Brady became the first player to throw five touchdowns in one quarter. It seems only fitting that a flurry of franchise records fell during a mid-October snowstorm. The historic sequence started with a flea flicker to Moss and ended with that familiar quick out to Wes Welker, who snuck inside the pylon. In between, Brady threw touchdowns to Moss, Welker, and Kevin Faulk, adding another one to Moss on the first drive after halftime before making way for backup Brian Hoyer. No great performance is possible without ineptitude from the opponent, and Tennessee quarterbacks Kerry Collins and Vince Young countered Brady with a 2-for-14 performance for negative-7 yards. When it snows, it … snows really hard? Come 2010, it was fair to wonder whether Vick’s once-breathtaking skills had eroded after spending three years without starting a game and two years out of the NFL entirely because of his dog-fighting scandal. Vick answered those questions with solid performances after replacing an injured Kevin Kolb, and then he straight-up embarrassed the questioners on Monday Night Football. On the first play from scrimmage, Vick delivered an 88-yard bomb — the left-handed flick traveled 60 yards in the air — to DeSean Jackson, who pranced backward into the end zone. The Eagles would score on their first five possessions; Vick added touchdown passes to LeSean McCoy and Jeremy Maclin and a 7-yard touchdown run. In 15 minutes, the Eagles offense accomplished more in Washington than some presidents do in four years. Vick added a second touchdown run before halftime and threw for another after the intermission. He probably solved the federal deficit, too. Or, maybe more improbably, six touchdowns and multiple two-point conversions.